This DVD has been available for several years, but now Decca has reissued it in a "special edition" which includes, at no extra cost, a 73-minute CD of highlights from the complete recording (which still is available as well). Frank Lopardo is no less impressive. His voice is almost baritonal, and it lacks Italianate warmth, but this is beautiful singing nevertheless. Even better, he makes Alfredo into a real character. How many Alfredos make a genuine impact? From early on, one senses both his immaturity and his potential for thoughtlessness, as well as his passion for Violetta. Much of the velvet has gone out of Leo Nucci's voice. One need not look very far to find a more beautiful performance of "Di Provenza il mar," for example, yet he marshals his diminished resources wisely, and his scene with Violetta in Act Two is beautifully done: at first we sense his coldness, then his cunning, and finally his respect and sympathy for the hapless "lost one." Gillian Knight's motherly Annina also deserves a mention. (It's clear that she doesn't think much of this Alfredo!) Richard Van Allan is an aged and dry Baron – an interesting touch that lends credibility to Violetta's decision to leave Parisian society and disappear with Alfredo between the first two acts. And Gheorghiu! Although she goes sharp now and then, occasionally coarsens her tonal production too much (her first cry of "Follie!" at the start of "Sempre libera" is not very musical), and is less of a coloratura than a dramatic soprano, hers is a Violetta for the ages – very much in the tradition of Maria Callas. She is a gifted actress and a beautiful woman, and these attributes, combined with the emotional power of her singing, makes a long-lasting impression. Her facial expressions in the final act will haunt my memory. This is a beautiful and well thought out production. The sets find just the right emotional tone for each of the scenes. (Flora's salon looks like it might fall down and crush Violetta.) Details such as Alfredo's embarrassment at the start of the Brindisi, his annoyance when the other guests flood back in after his duet with Violetta later in that act, and the spatterings of blood on Violetta's bedding and handkerchiefs in the final scene show director Richard Eyre's concern for realism. And finally, Violetta and Flora are allowed to give parties that actually look like fun! Violetta is a courtesan, after all, and Act One should not look like a middle-class wedding banquet, as it often does. Curtain calls between acts are kept to a minimum, but at the end of the opera, we are allowed to share the audience's frenzied acclaim for everyone involved. (Gheorghiu is almost buried in flowers!) I listened to the program in stereo, and I thought the sound was outstanding. (Digital 5.1 surround is the other option.) The video aspect ratio is 4:3. Subtitling is managed both neatly and completely, except in the concerted passages. Unless good-quality video of complete performance by Callas ever emerges – dream on! 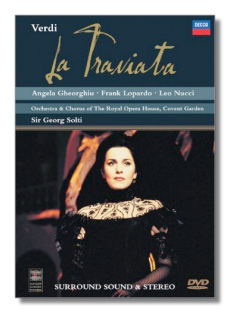 – this is the La Traviata of choice on DVD.